The Vikings are coming!! !steemCreated with Sketch. It wasn't much fun being a monk in 10th century Ireland. What with the getting up at 5:45am, the hard work growing all your own food, medieval diseases by the score and of course falling foul of pillaging Viking. About 5 miles from where I grew up is a stone tower, all that remains of a thriving medieval monastery. Oddly I'd never actually visited the tower until the other day. The monastery was burnt to the ground in the 12th century and all that remains is the well preserved tower. Historians think that the tower, built around the 10th century was used to protect against Viking raiders or as a bell tower similar to those appearing across continental Europe at the same time. 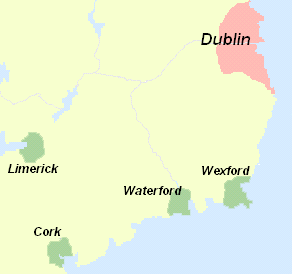 In the 9th century many of Ireland's future cities like Cork and Dublin were founded by Vikings initially as trading and raiding posts, so a Viking raid was a real threat. Viking ships sailed the seas between Ireland and England with impunity as they controlled much of the territory in Northern England, in the North of Scotland, the Isle of Man and much of the South and West coasts of Ireland. The Viking age in Ireland lasted from 800 until the arrival of the Normans, who in their own way were just more Vikings with better marketing. The word Norman comes from Norseman or North Man. They swept through England and Wales in 1066 and arrived in Ireland a century later bring an end to the age of the Vikings. Anyway. back to the Antrim round tower. It's in remarkable condition given that it has been around for over a millennium. The entrance door is around 2 meters above ground level for protection and would most likely have been accessed by a ladder. 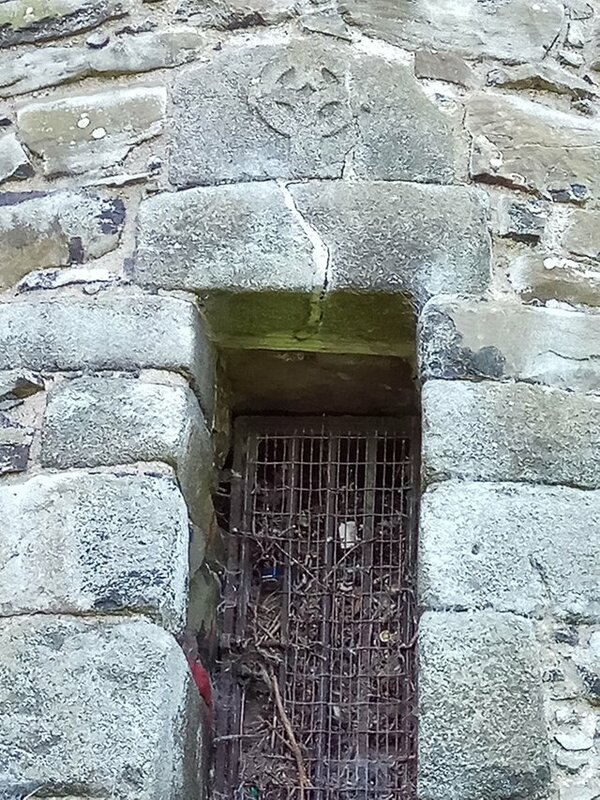 It has a well preserved celtic cross carved above the door. 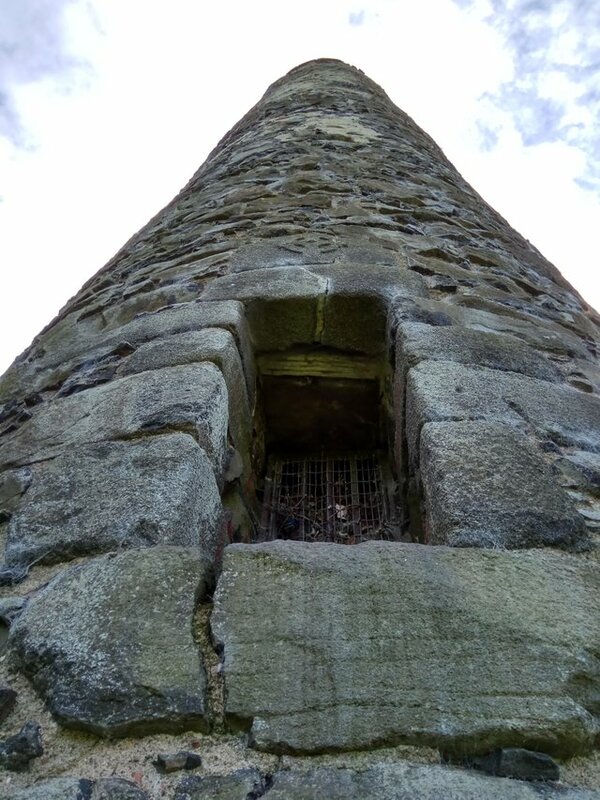 This picture shows the door on the left hand side of the 28 metre high tower and not far away is a mysterious stone with two bowl shaped depressions. This is called the witches stone according to local legend. According to tradition the local witch was not happy about the tower being built and she jumped from the top of it leaving depressions when her elbow and her knee hit the rock. These stones are not uncommon at religious sites and are know as 'Bullauns'. 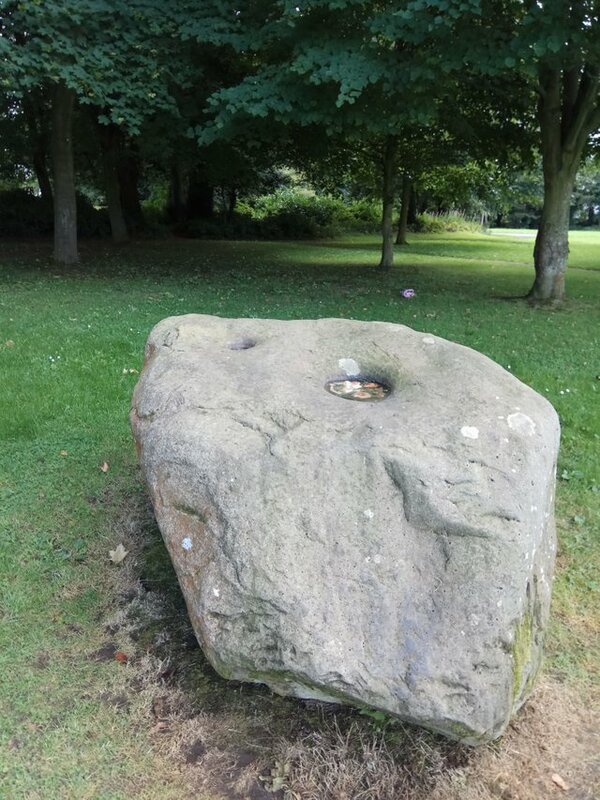 Bullaun stones were once thought to be fonts for baptising the local pagans, but the latest theory is that they were used as a mortar for grinding grain or herbs. 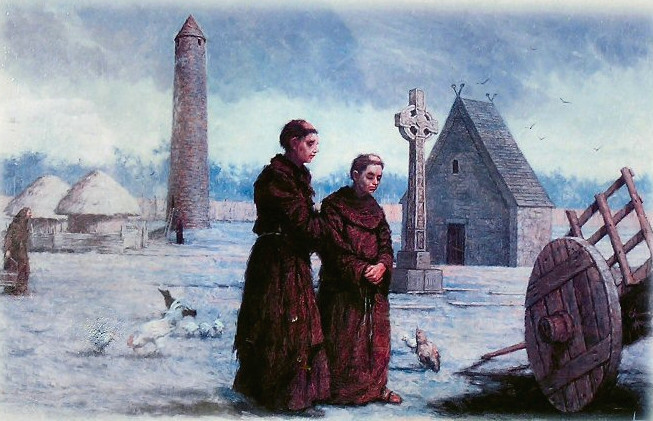 Historically the monastery was linked to the Abbey at Bangor in Co. Down and in fact after a Viking raid on Bangor the remains of Bangor's founder St. Comgall were moved to Antrim for safe keeping. The monastery was destroyed once in 1018 and finally burned to the ground in 1147. Man that thing is impressive! So many people had to get hurt building that thing. The stone will last forever and its obvious that it's constructed well. Hey thanks for the upvote on my last post too! I appreciate it.....thanks for check out my blog brother. Thanks man. Looks like Steemit is on the up in Colorado Springs. We have our monthly Dublin meetup next weekend. Thanks @Josie2214, just taking a break due to the somewhat hectic nature of work. I'm hoping to post more regularly now again. "Normans, who in their own way were just more Vikings with better marketing." It was going to be "Normans, who in their own way were just more Vikings who had learned a few manners from living in France for half a century." Thanks @Josie2214, just the usual distractions of work and life getting in the way. A little nudge now and again helps, thanks!! Stunning images. 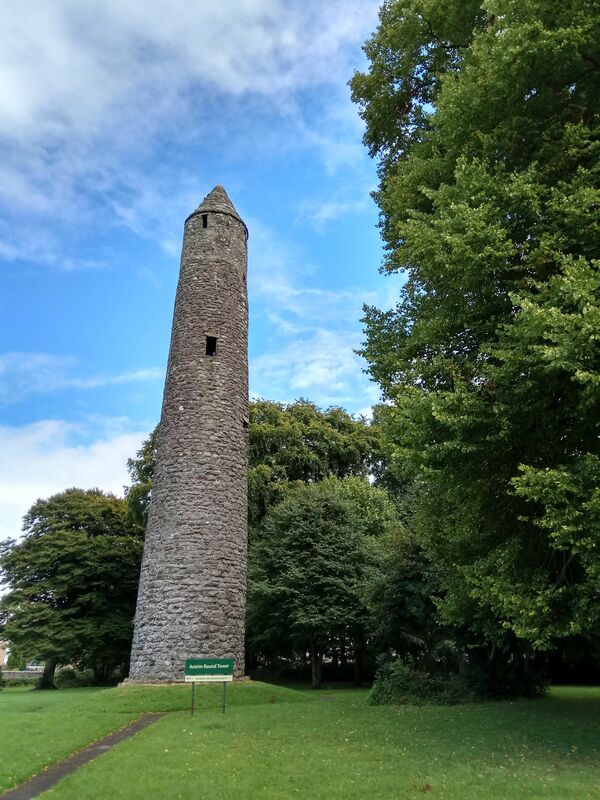 We have a well-preserved round town here in Dublin - Clondalkin - but I have never seen the Antrim Round Tower. Thanks for sharing. Thanks @harlotscurse. You should try to make it along to the Steem meetup this weekend, it would be great to catch up with you. That's a nice picture @brightongreg. These things are hidden gems, all typically 1000+ years old and must be close to the oldest buildings in the country, but they seems to be pretty much ignored by everyone. Thanks! As I mentioned in my post if we hadn't wandered off the main road to find pottery we would never have discovered it! I took the road less travelled once and wasn't heard from again for a week. Very good post, Max, I guess entry is banned nowadays due to health and safety. This was a really nice post. Nicely done, well structured. Definitely going to lookout for your future posts. Thanks for sharing. Hey thanks @firepower much appreciated. Dia dhuit! Very accurate post! 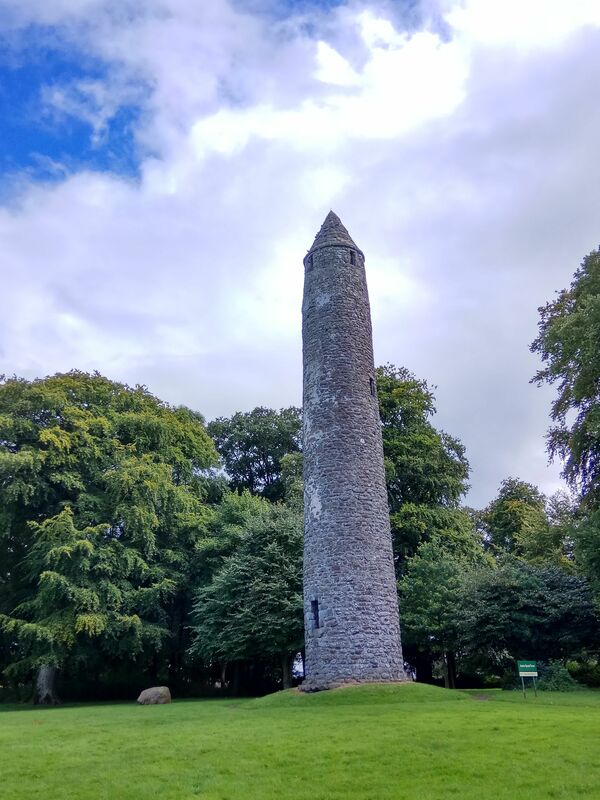 Your writing made me think of my visit to Monasterboice Monastery, near Mellifont Abbey, there also a round tower survived, but not in such a good condition as the Antrim one. I've driven past the sign for it many's a time on my way from Belfast to Dublin. I always seem to be in such a rush. I'm heading down to Dublin next weekend for the Steem meetup, so I might give myself an extra hour if the weather is good. Hey, keep them coming you have a very unique perspective! I love reading about history and seeing actual sites where it happened. It's amazing the height and size of the tower. Very cool shots! I love this kinds of stuff. Thanks for sharing with us. Congratulations! This post has been upvoted from the communal account, @minnowsupport, by maxbullion from the Minnow Support Project. It's a witness project run by aggroed, ausbitbank, teamsteem, theprophet0, someguy123, neoxian, followbtcnews/crimsonclad, and netuoso. The goal is to help Steemit grow by supporting Minnows and creating a social network. Please find us in the Peace, Abundance, and Liberty Network (PALnet) Discord Channel. It's a completely public and open space to all members of the Steemit community who voluntarily choose to be there. Nice post! I have seen the series Vikings recently so your post reminds me of it. Yeah, it's a well made series. Very cruel though! I was passing this site once on my way from Belfast to Dublin and never stopped, now I regret. This tower looks amazing and it has very decent size. Technically it's in Antrim, not too far from Belfast in the other direction, but given that I grew up so close to it and never visited it's easy to miss. It's actually in the town with housing developments all round and only 100 yards from the main road, but almost invisible from it because of the large trees. I'm sure it's this tower I've seen, been driving around a bit in that area, must be the weather not so good what makes us not to go and see it from the close. One day we will visit it if we are near it. Yes must have been, the only other ones I know of near by are at Armour and it's just a stump. They're amazing, it's I'm pretty sure the oldest building in County Antrim and given that it has Carrickfergus Castle beating that in age takes some doing. Thank you for sharing this story from a land where legends remain!!!! Yes we have our fair share of legends, the occasional one might even be true! Having watched the "Vikings" series this was super interesting knowledge. I haven't seen it, I must give it a watch. Very interesting and informative post @maxbullion. A well-documented page of history. Thanks for sharing! Thanks @adrianv. I appreciate the complement. excellent work, my friend. follow you. This post has received a 19.49 % upvote from @booster thanks to: @maxbullion. Amazing images....following you for more. This post was resteemed by @resteembot! The @resteembot users are a small but growing community. Check out the other resteemed posts in resteembot's feed. Some of them are truly great. This wonderful post has received a bellyrub of 12.19 % upvote from @bellyrub thanks to this cool cat: @maxbullion. My pops @zeartul is one of your top steemit witness, if you like my bellyrubs please go vote for him, if you love what he is doing vote for this comment as well.